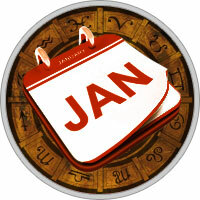 You begin your year with 80 and sometimes 90 per cent of the planets in the Western, social sector of your chart. In fact they are at their maximum Westerly point right now. You are in a strong social period. Your destiny seems in the hands of other people, which is a difficult position for a regal Leo to be in. Your personal gifts seem to matter little. It is likeability that matters now, in almost every area of life. Leos like to have their way and are used to having their way - but your way might not be the best way this period. Personal inde­pendence is not strong right now. This is a time to cultivate the social skills, to attain your ends by consensus and to adapt to situations as best you can. The King is far from his throne, in exile in a strange territory. He can't convey the full force of his will and personality. This is a temporary situ­ation and will change in a few months. Right now adapt to things as best you can. Make a note of conditions that need to be changed, and when your period of personal indepen­dence comes you will be able to make those changes. On the 19th you enter a yearly love and social peak. The love life is both active and good. The main problem in love - and you will have this all year - is getting the family to accept the beloved and vice versa. There seems to be a lot of tension there. Other things happen on the 19th as well. The planetary power shifts from the lower half of the Horoscope to the upper half. Thus dawn is breaking in your year. It is time to start focusing on your outer worldly objectives and to pursue them in physical and tangible ways. Your career planet will spend the month in your 7th house, thus others are very important in the career. Advancement depends on them. This also indicates that you further the career by social means, by attending or hosting the right kinds of parties and by developing the right social connections. Health is more delicate after the 19th. As always the main preventive measure is to rest and relax more, to maintain high energy levels. Though you tend to be a speculator, money is earned the old-fashioned way through hard work until the 19th. This is not the chart of the lottery winner. However, Lady Luck returns to you from the 22nd to the 24th. There is a nice payday or some good financial opportunity. The 25th to the 27th also seems fortunate in that department. The planetary momentum is strongly forward this month: 90 per cent of the planets are moving forward until the 30th and after that ALL the planets are moving forward. Thus it is an excellent time to launch new products or ventures into the world. The 11th to the 27th is especially good.